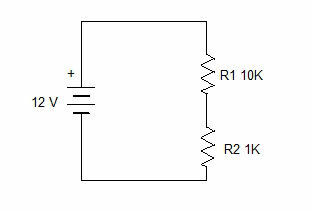 As you know, when a resistor is connected across the positive and negative rails of a power supply, some voltage will be dropped through the resistor. This is due to the resistance offered by the resistor. Let us see one example. In a circuit diagram, we can see a number of Resistors connected in series or parallel between the positive and negative rails. 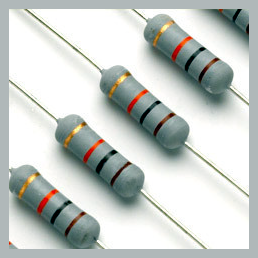 These resistors are controlling the voltage and current to the particular sections of the circuit. When we design a circuit, we should have an idea about the voltage and current requirements for each section of the circuit. Then only we can select the proper values of resistors. If you know this, you can easily answer the questions in Project Viva regarding the selection of resistors. An Electronics Hobbyist needs to know the symbols of the electronic components in the Circuit diagram. Before starting the construction of a circuit, it is necessary to study the circuit diagram first. It has a number of symbols with the values marked. There are different symbols for representing the components. So it is necessary to study the symbols generally appearing in circuits. For a Beginner, identification of Resistors is a big problem. So byhearting the Colour code is essential. But some tricks are available to identify the resistors easily. A Resistor is a passive component inevitable in circuits to reduce the voltage and current in a particular section of circuit. Resistor is non polarized with two leads for connections. Starting a series of articles to explain the circuit design considerations and troubleshooting to cure defects. When we see a circuit, sometimes we think that how these components are selected? Why some additional components are included to make the circuit over designed? Why a specific value component is selected. All these are some of the common doubts arise when we see a circuit. Circuit design is an art which has many aims. First is its proper working and second is its compactness. In addition to this, we have to use rare components not easily seen in common circuits for the purpose of introducing their working to hobbyists. Another important thing to remember while selecting a component, especially ICs, transistors, sensors etc, is the ultimate result of the circuit to satisfy our needs. A circuit can be designed in different ways according to the idea of the designer. Some designers design the circuit using only a few components with a concept that this is sufficient and it is easy to describe. The circuit will work but we cannot study anything from it. If the circuit is slightly complicated, the performance will be more accurate and a student can analyze the working of each section in the circuit. See, a hobbyist or a circuit designer is not designing the circuit for the purpose of commercial sale but to understand the basics of electronics. For commercial applications, the design is entirely different and the only aim is to satisfy the needs, low cost and low size. You can see the power supply in china make low cost LED light. They are using only a capacitor and a diode to convert AC to DC. So, design the circuit as per your idea, interest and purpose. Do not try to follow others because each person has his own ideas and the way of designing. Do not under estimate other’s designs because it is their design according to their mind. But the ultimate aim should be proper working of the circuit. We can light an LED with a series resistor starting from 100 ohms to 1 kilo ohms with a 12 volt supply. Take your own value depending on the forward voltage of the LED. Only difference is change in brightness and current consumption. If you use a high value resistor, brightness will be reduced. So it is your choice according the requirement. If a circuit is not working, don’t throw it away. Find out the error and make it working. There lies your skill and ability. Experimentation is always better than too much theory and calculations using paper and pen. Electronics is a Fun and Hobby and you can try a circuit if you have some basic knowledge in electronics. Circuit making is an interesting hobby and it will improve your memory; sharpness and more over you will utilize the spare time to learn more. 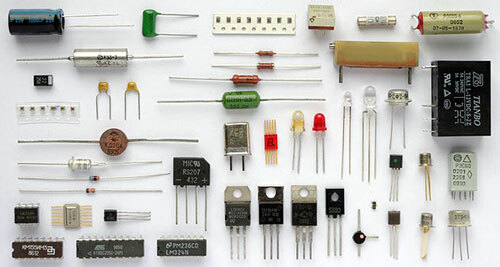 The Articles posted here in series will help you to understand the working of electronic components. Component identification tips, Pin assignment of components etc will also be included. Start electronics and enjoy its beauty. As you know the resistor is an inevitable part of a circuit. 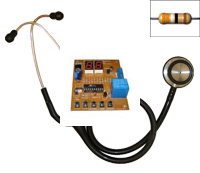 It is meant for reducing the current and voltage in the circuit parts. Resistors are identified using the standard colour code chart. 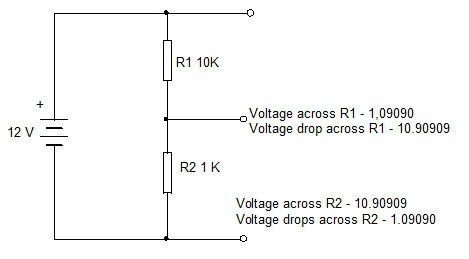 A simple trick can be used to identify the resistor value range. The third colour band on the body of the resistor represents the multiplier value. So by identifying the third colour, it easy to know the value in range.